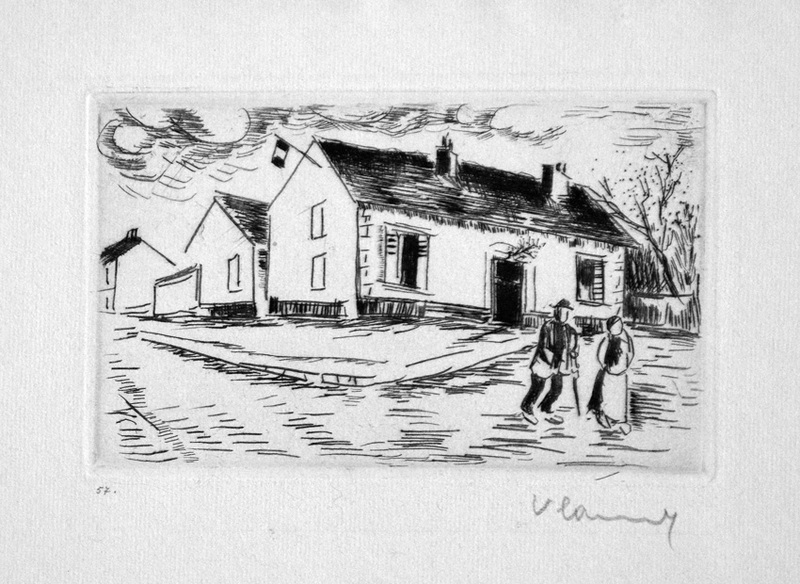 Vlaminck was a professional athlete, a professional musician, a poet and novelist, and a painterprintmaker; of all his occupations, that of artist was the one he most clung to for most of his life. One of the original group of Fauves (along with Matisse and Derain) who showed at the Salon d'Automne in 1905, his two strongest influences were Van Gogh and Cezanne, but his greatest love as a painter was color. 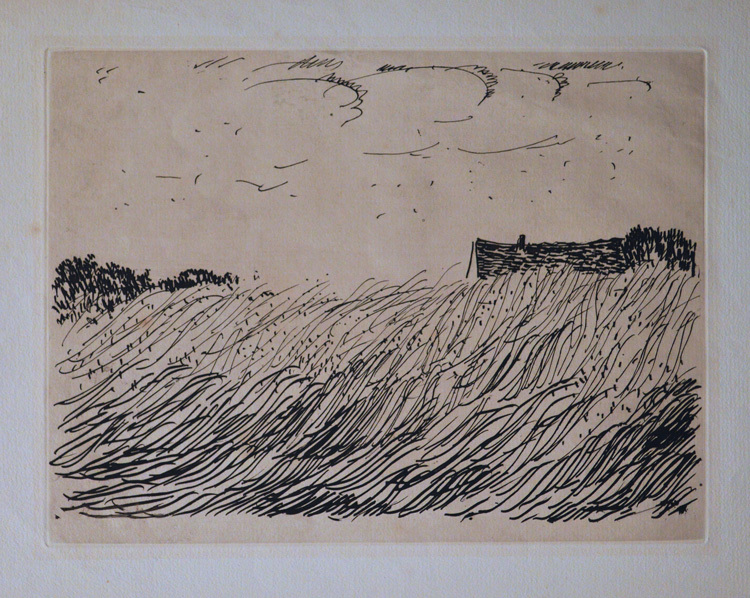 He was also a prolific printmaker for many years, but most of his earlier works are printed in black and white. But whether he is working in color or in black and white, his style is as good as a signature to identify his works. As Jean Selz has observed in his study, Vlaminck (trans. Graham Snell, [NY: Crown, n.d.], pp. 75-76), "It became possible to speak of Vlaminck's own style because of the consistency, amounting to that of a leitmotiv, with which a certain landscape appeared in his work: a road . . . running across an area of land that the painter has chosen not for its picturesque qualities but rather, it seems, for its nondescript appearance; it looks like so many lumps of earth and as our eyes scan it they linger not so much to admire the spectacle as to draw a life-giving force from it, the same force that impels the march of the seasons, the perpetual round of Nature, the flow of sap in the tree and the ear of corn to swell. 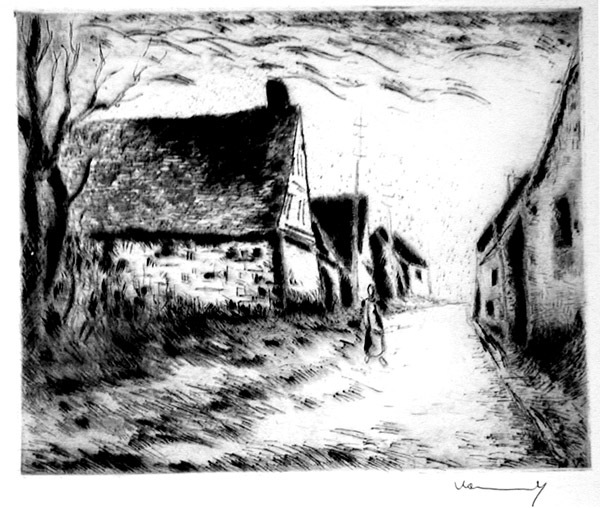 This sense of throbbing life is something we feel in the way Vlaminck painted things, and it even infuses the peasant's cottage, standing between the road and the fields, where we have an apprehension of the toilsome lives of the people that live in it." Selz also suggests that Vlaminck's perspective of the countryside owes something to the way a professional bike racer, bent over his handlebars to cut down on air resistance, catches snatches of vision as he speeds by, an idea that looks better the more we look at Vlaminck's landscapes. Vlaminck's works are in every major museum collection; one of his paintings made a new record for the artist in 2002, selling at auction at Christie's (London) for over $10,100,000 (the estimate had been $4 to $5 million). Selected Bibliography: Galerie Charpentier, L'Oeuvre de Vlaminck: Du Fauvisme a nos Jours (Paris: Galerie Charpentier, 1956: essay on Vlaminck by Claude Roger-Marx, catalogue of 198 works, brief essay by Pierre Mazars, selection of impressive plates); Florent Fels, Vlaminck (Paris: Marcel Seheur, 1928); Maurice Genevoix, Vlaminck. L'homme. L'oeuvre (Paris: Flammarion, 1954); Daniel Henry [pseud., Daniel-Henry Kahnweiler], Maurice De Vlaminck (Junge Kunst. 11: Leipzig: Klinkhardt & Biermann, 1920); Klaus G. Perls, Vlaminck (NY: Crown, 1941); Jacques Perry with photographs by Roger Hauert, Maurice de Vlaminck (Geneve: Rene Kister, 1957); Gabriel Reuillard and Maurice de Vlaminck, Grasse Normandie. L'Invitation au Voyage with 87 previously unpublished drawings by Maurice de Vlaminck (Paris: Andre Delpeuch, 1927); Marcel Sauvage, Vlaminck. Sa vie et son message (Geneve: Pierre Cailler, 1956); Jean Selz, Vlaminck (New York: Crown, n.d.); Maurice de Vlaminck, Dangerous Corner (New York: Abelard-Schuman, 1961); Katalin De Walterskirschen, Maurice De Vlaminck. Catalogue Raisonne de L'oeuvre Grave (Paris: Flammarion, 1974; the standard reference to Vlaminkc's original prints); Leon Werth, Vlaminck. Vingt et une reproductions d'apres ses tableaux (Paris: Les editions Bernheim-Jeune, 1925). Boissy-les-Perches (W. 148). 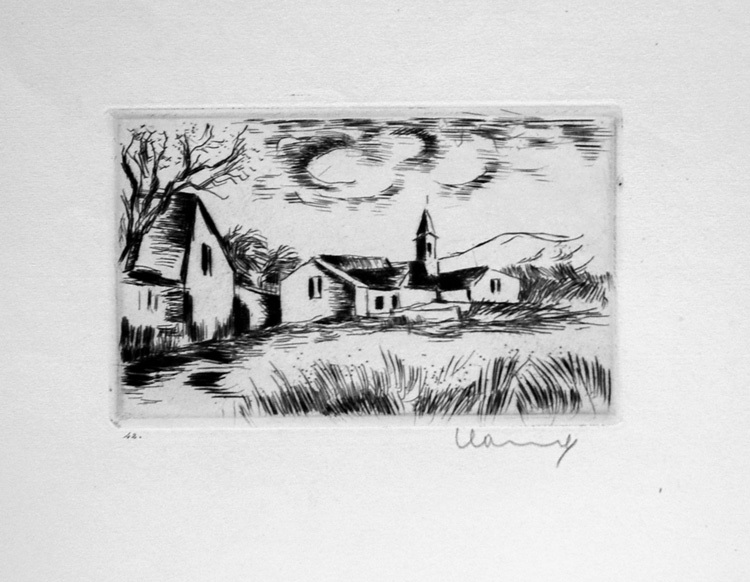 Original etching and drypoint, 1951. Edition: 50 signed and numbered impressions on Rives. Ours is a brilliant proof before the edition printed on Arches paper, signed in ink and titled in the lower left corner, "Chemin à Boissy-les-Perches" (not visible in photo). See Walterskirchen p. 128 for another example on Arches like ours, also titled in ink like ours, and presented in 1953 as a gift. Image size: 258x319mm. Price: SOLD. Boissy-les-Perches (W. 148). Original etching and drypoint with hand-coloring, 1951. Edition: 50 pencil-signed and numbered impressions on Rives, of which ours is n. 31/50. Walterskirchen p. 128 describes the published state as "Fortement mordu à l'acid, violents contrastes" (strongly bitten in acid, violent contrasts); he does not, however, mention any hand-colored impressions as our (in the roof of the first house on the left, in the steeple of the house next to it, in the top of the wall closest to us, and, faintly, in the grass and the street. Rare with the hand-coloring! Image size: 258x319mm. Price: $5000. The color is slightly less bright than pictured above. Beaumont / Oise (W. 118). Original drypoint and etching, 1927. 875 impressions for Georges Duhamels' Vlaminck (Paris, 1927); our impression is one of 850 on velin teinté d'Annecy. A beautiful early impression (from 37/875). Vlaminck (along with Matisse, Rouault, and Derain) was one of the original Fauves. Image size: 100x137mm. Price: $975. Nesles la Vallée (W. 119). Original drypoint and etching, 1927. 875 impressions for Georges Duhamels' Vlaminck (Paris, 1927); our impression is one of 850 on velin teinté d'Annecy. A beautiful early impression (from 37/875). Vlaminck (along with Matisse, Rouault, and Derain) was one of the original Fauves. Image size: 102x136mm. Price: $975. 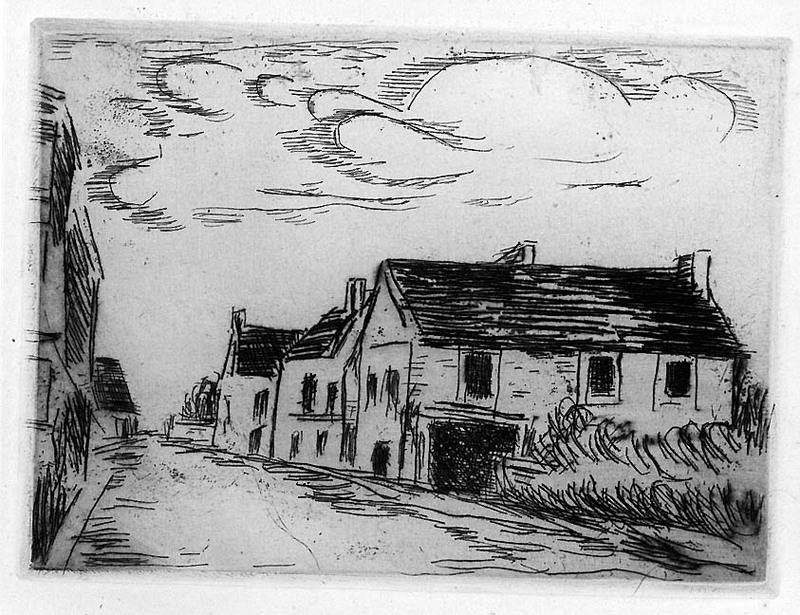 Environs de Marines / Oise (W. 120). Original drypoint and etching, 1927. 875 impressions for Georges Duhamels' Vlaminck (Paris, 1927); our impression is one of 850 on velin teinté d'Annecy. A beautiful early impression (from 37/875). Vlaminck (along with Matisse, Rouault, and Derain) was one of the original Fauves. Image size: 101x136mm. Price: $975. 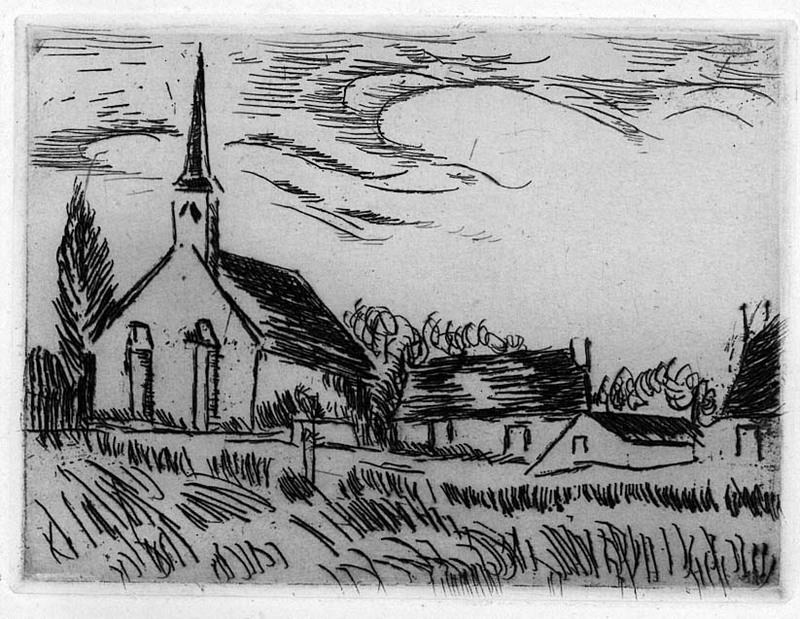 Une Eglise dans le Vexin (W. 121) . Original drypoint and etching, 1927. 875 impressions for Georges Duhamels' Vlaminck (Paris, 1927); our impression is one of 850 on velin teinté d'Annecy. A beautiful early impression (from 37/875). Vlaminck (along with Matisse, Rouault, and Derain) was one of the original Fauves. Image size: 101x136mm. Price: SOLD. La Mairie / THe Town Hall (W. 125). Original drypoint and etching, 1927. This is plate 3 of a set of 10 devoted to Visages des Maisons. 25 signed impressions impressions on Japon and 50 on vergé Holande de van Gelder with the drystamp of the publisher, Galeries des Peintres-Graveurs, of which ours is n. 57. The blank borders have been slightly trimmed away from the platemark. Edmund Frapier, the director, also published works by Rouault and many other important modernist artists. Vlaminck (along with Matisse, Rouault, and Derain) was one of the original Fauves. Image size: 102x168mm; paper size: 209x336mm. Price: $2250. Le Pigeonnier (W. 129). Original drypoint and etching, 1927. 25 signed impressions impressions on Japonand 50 on vergé Holande de van Gelder with the drystamp of the publisher, Galeries des Peintres-Graveurs, of which ours is n. 42. Frapier, the director, also published works by Rouault and many other important modernist artists. This is plate 7 of the Suite Visage de Maisons. Vlaminck (along with Matisse, Rouault, and Derain) was one of the original Fauves. Image size: 103x166mm; paper size: 310x506mm. Price: $2250. Cafe de Paris (W. 132) . Original drypoint and etching, 1927. 25 signed impressions impressions on Japon and 50 on vergé Holande de van Gelder with the drystamp of the publisher, Galeries des Peintres-Graveurs, of which ours is n. 42. Frapier, the director, also published works by Rouault and many other important modernist artists. This is plate 10 of the Suite Visage de Maisons. Vlaminck (along with Matisse, Rouault, and Derain) was one of the original Fauves. Image size: 103x166mm; paper size: 310x506mm. Price: $2250. 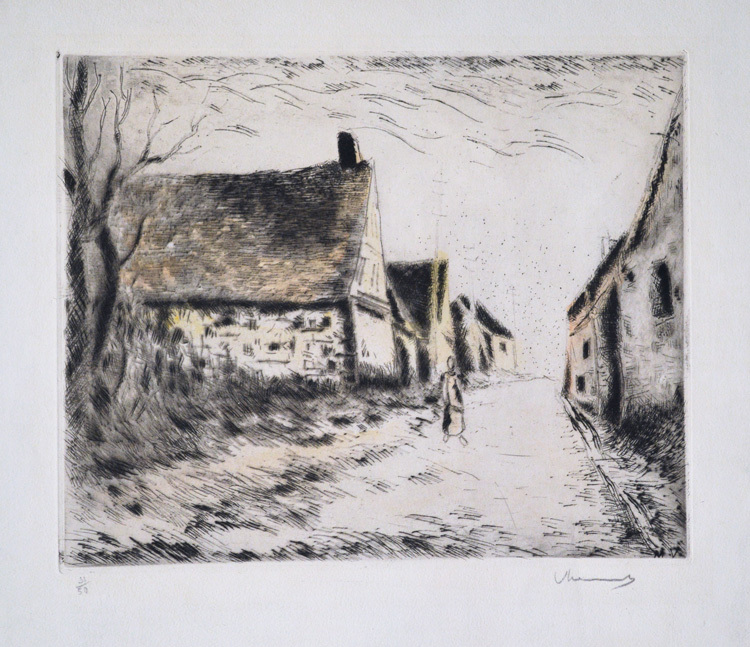 La Rue de la Glaciere (W. 146), Original etching, 1937. 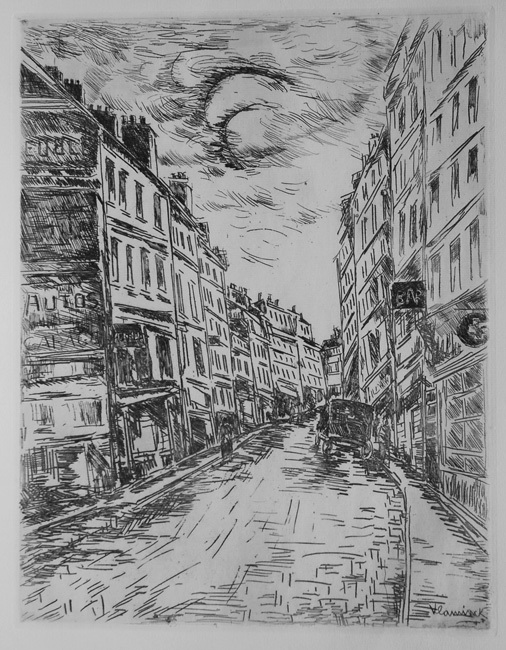 500 impressions for Paris 1937 plus proofs with large margins, of which this is one. Ours is an impression on M.B.M. paper with wide margins outside the portfolio edition. Paris 1937 was one of the grand collective projects of the middle third of the 20th century and included orginal etchings by 31 artists including Matisse, Gromaire, Vlaminck, Derain, Dufy, Laurencin, Bonnard, Kisling, and Dunoyer de Segonzac, among others. Signed in the plate. Image size: 332x260mm. Price: $850. Paysage d' Éte (W. 147). 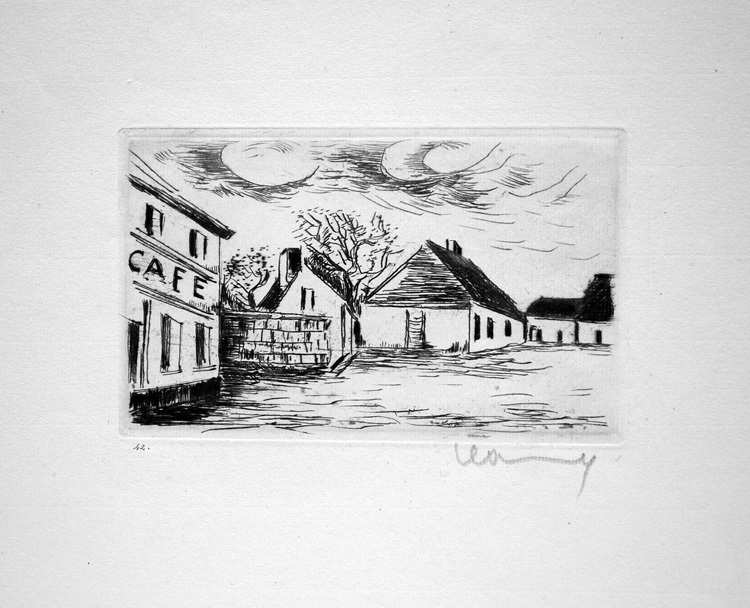 Original etching and drypoint, 1951. 250 portfolios with the etching printed on Arches paper, 50 of which included a suite on Chine. There were also 25 impressions on Japon impérial and 25 on Japon nacre. 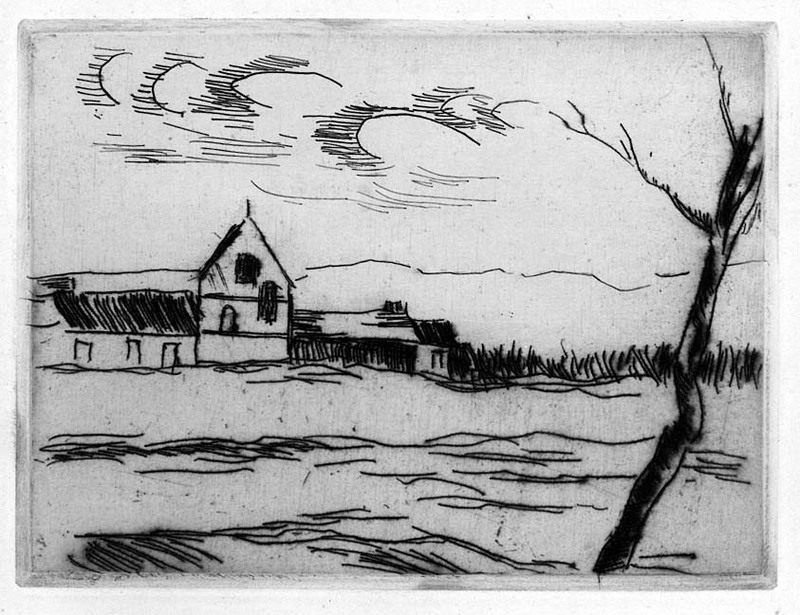 The impressions on Chine and Japon were pencil signed by Vlaminck; the impressions on Arches were not. 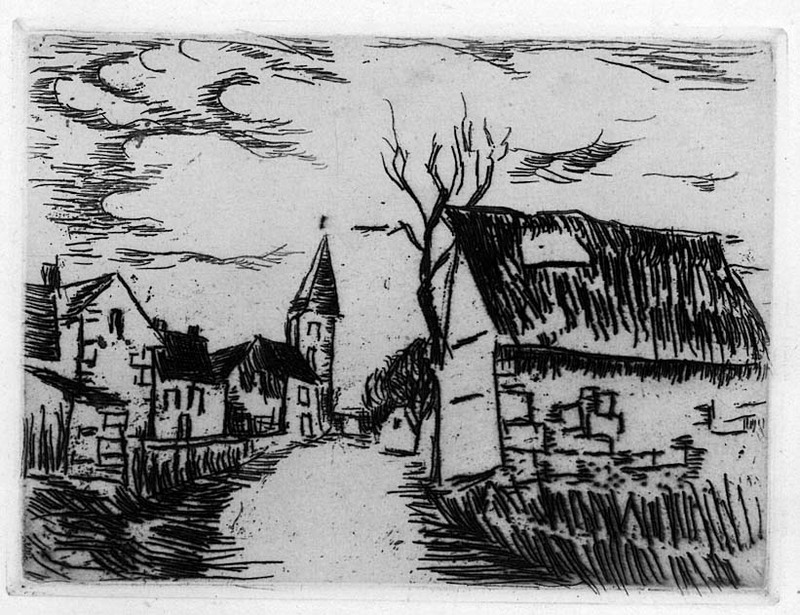 This is one of Vlaminck's largest etchings. Ours is a trial proof with rich plate tone on heavy laid paper before the edition; light mat burn just outside the platemark. Image size: 270x360mm. Mat size: 20x24 inches. Price. $2500. Impressionist and Post-Impressionist Prints and Drawings: Prints by Pierre Bonnard, Georges Braque, Charles Camoin, Mary Cassatt, Paul Cezanne, Henri Edmond Cross, Edgar Degas, Sonia Delaunay, Maurice Denis, André Derain, Susanne Duchamp, Raoul Dufy, Jean-Louis Forain, Paul Gauguin, Marie Laurencin, Edouard Manet, Henri Matisse, Berthé Morisot, Pablo Picasso, Pierre Auguste Renoir, Georges Rouault, Ker Xavier Roussel, Paul Signac, Henri Toulouse-Lautrec, Suzanne Valadon, Maurice de Vlaminck, James A. McNeill Whistler, and others.